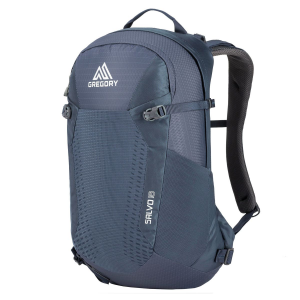 The Gregory Salvo 28 liter backpack is, quite simply, an awesome, well designed backpack, featuring great suspension and a ventilation system that actually works. 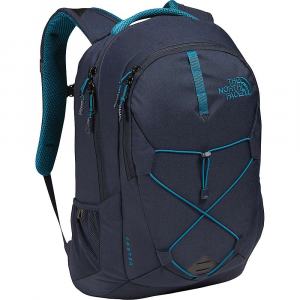 It's perfect for long day hikes with room for all the gear you'd need for pretty much any adventure. I have to admit, when I look at daypacks, one of my top priorities is lots of pockets, cubby holes, and other ways to sort and store my gear. Perhaps it's because I carry lots of stuff—even when out on day hikes—and I like to be able to get to my stuff quickly and easily. Next, I look at the suspension system, which needs to allow me to carry about 20+ pounds comfortably. The Gregory Salvo 28 fits the bill perfectly. 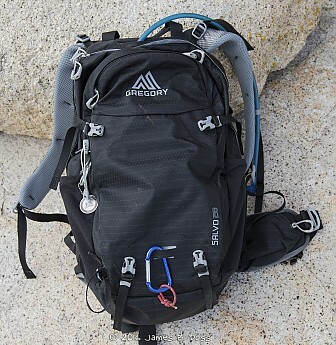 The Gregory Salvo 28 is a nice looking pack, weighing in at 2lbs, 7 oz (1,105 grams). 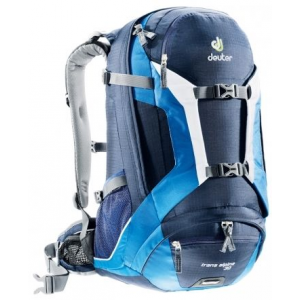 It is constructed of 210-denier nylon with a polyester lining. 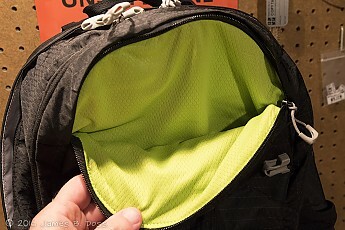 It has clamshell zippered access to the main compartment, which has an inner sleeve for a hydration bladder. Additional storage is available via a second compartment, which contains a small, zippered compartment which is perfect for your keys, first aid kit, etc. There is a third accessory pocket, outside near the top, with a soft lining—a great place for your sunglasses or other items often needed. There are two small hip belt pockets large enough for a couple of Clif Bars each and two side stretch water bottle pockets, which hold a 20 oz water bottle perfectly. 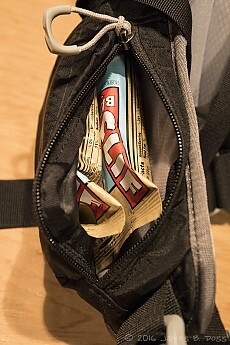 Hip belt pocket with two Clif bars. Sunglass pocket is lined with a soft material. Also included are loops to hold trekking poles, water bladder hose management loops, and enough compression straps to keep any load firmly in place. 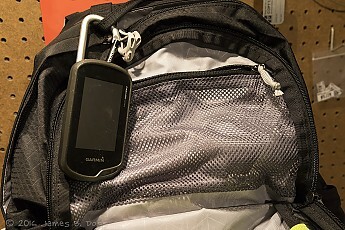 Inside mesh pocket with GPS for scale. Missing are a crampon patch, a helmet attachment system, and built-in rain cover. The suspension system on the Salvo 28 is darn near perfect. And Gregory's new ventilated suspension technology, which they call "Freespan" works wonderfully. In fact, I'll go as far to say that it's the best fitting and vented daypack I've ever owned. The Freespan suspension system consists of three parts. 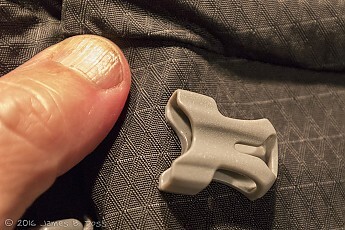 The first is a pair of aluminum rods running up the sides, which adds stiffness and rigidity to the entire pack. It's sort of a non-removable internal frame of sorts. The second is an aluminum leaf spring (Gregory's description) which provides lumber support. This is also non removable and is covered with foam padding. Lastly is the mesh back panel, sized at about 8 inches by 11 inches, which provides airflow. 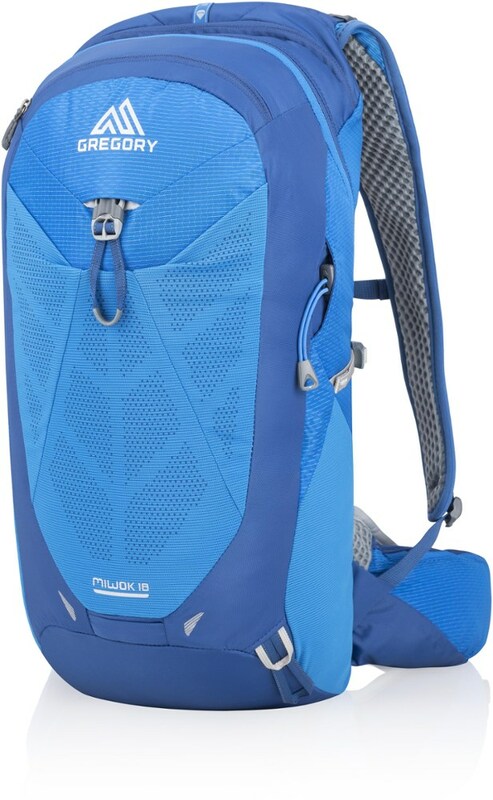 The entire system works very well together and holds the backpack off of your back 1 to 2 inches (depending where measured), giving the pack ample room to ventilate. It also allows for carrying heaver loads, since there is quite a bit of rigidity to the pack. 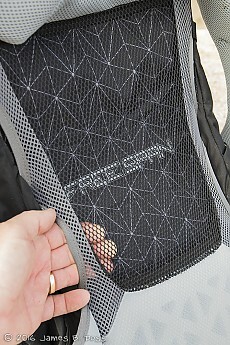 Closeup of the mesh back. The shoulder straps and hipbelt are form padded, providing plenty of comfort for loads up to 25 pounds. Both are easily adjustable with a tug of a strap tail. 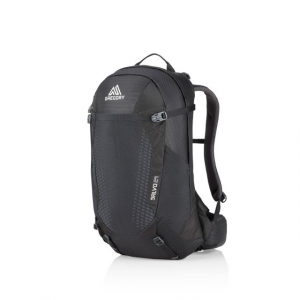 The shoulder straps also have load lifters, adding extra adjustability to the entire system. I'm of an average build and height: 5'8" at 165 pounds. I found the Salvo 28 to fit me perfectly. 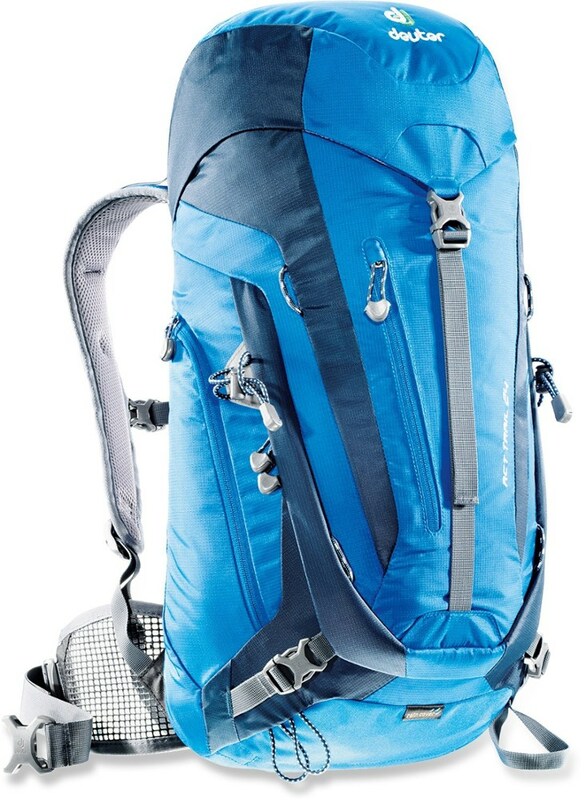 Pack size is 51cm in length, 31cm in width, and 25cm deep, as taken from Gregory. Torso length is from 46 to 51 cm and the hipbelt is adjustable from 66 to 102cm, also from Gregory. While the Salvo 28 is only available in one size, its wide range of adjustability should accommodate all but the largest and smallest of hikers. The perfect pack (for me). My normal load on a day hike runs about 12 to 15 pounds, which includes three liters or more of water, a full-sided DSLR camera, GPS, extra batteries, windbreaker, first aid kit, knife, extra reading glasses, emergency rations, lunch, and more. 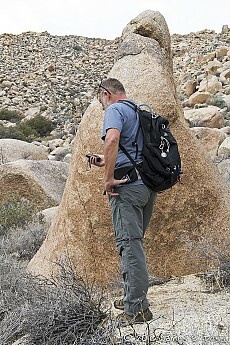 I sometimes carry a handheld HAM radio as well. Needless to say, this is a lot of stuff and the Salvo 28 swallows it all up with room to spare. 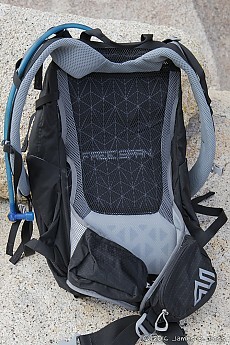 I've used this pack exclusively when out on day hikes since receiving it. All of the hikes were of at least six miles, except for one, which was shorter, but was a very steep, cross country, boulder scramble to visit a pictograph site in the Anza-Borrego desert. Temperatures ranged from the mid-50s to the mid-70s. I found the pack to work perfectly. It carried loads well and was very comfortable. In fact, I found loads actually felt lighter than they really were. The hip belt and the padded shoulder straps, along with the load lifters made the weight all but disappear. On the warmest day—and the day I made that steep hike—the Freespan suspension not only felt comfortable, but it kept my back mostly dry and sweat-free. While scrambling and climbing over rocks and boulders, the pack hugged me well and did not swing or move around at all. As spring and summer approaches, I'll be looking forward to see how the Freespan system handles the desert heat, but if what I've experienced so far is of any indication, I'm sure there will be no issues what-so-ever. I have to say, I really like this pack. But, nothing is 100 percent perfect, and there were a few nitpicks, however. While nothing here is a deal killer by any stretch of the imagination, here are a few things that I'd like to see improved upon. 1. 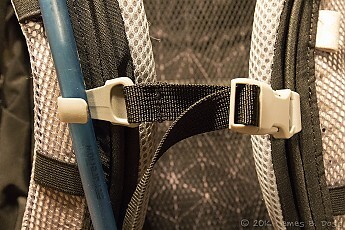 The water hose clip, which is placed on the right-side shoulder strap and is part of the sternum strap, cannot be relocated to the other side. Are you used to having the hose come over your left shoulder? Too bad, if you move it, you'll have to do without using the clip. 2. All of the compression strap buckles (the female end) are sewn down to the pack. This makes it a bit fiddly when snapping the clips down. I'd like to see them on a very short piece of webbing. them a tad fiddly to use. 3. I would have liked to see a few small pockets sewn into the small accessory pocket to accommodate a pen or other small item. 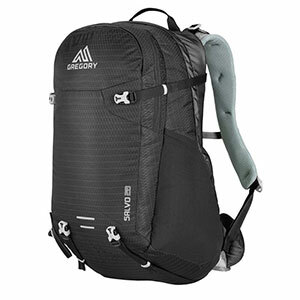 I whole-heartedly recommend the Gregory Salvo 28 to anyone who is looking for a well designed, lightweight, comfortable daypack, and who would be carrying loads up to 25 pounds. While the Salvo will also be available in 18 and 24 liter sizes, the 28 liter size might be a bit too large for mountain biking or skiing. But this is going by past experiences with other packs and not with the Salvo 28. If I were in the market for a new pack of this size, I would put the Gregory Salvo 28 at the top of my list. It's that good. And at a reasonable $129 MSRP, I wouldn't even wait for it to go on sale. In its official website, it said this bag is waterproof. Maybe that's why it doesn't come with a rain cover.